Save AED 21 (40.38%) – Earn 3 Shukrans What is Shukran? Shukran is the Landmark Group’s award-winning loyalty programme in the Middle East, which allows you to earn Shukrans when you shop any of our brands. 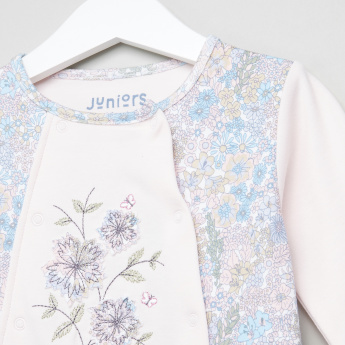 Showcasing a beautiful floral print along with embroidery, this sleepsuit is a must-have for your child. The cuffed hems of the open feet and long sleeves lend a snug and warm feel to your baby.